the season 2 fall season finale of amc's "the walking dead" aired last sunday, concluding frank darabont's (shawshank redemption) run as showrunner amid rumored creative differences with the network. through 7 episodes, the show will resume in feb 2012 with 5 new episodes and glen mazzara serving as the new showrunner. how that will affect the show we won't know for sure, but this is a good time to review what we've seen so far. 'the walking dead' is based on the comic book of the same name, by robert kirkman. season 1, consisting of 6 episodes aired last year to much critical acclaim and commercial success. it had easily become amc's top rated show (by far eclipsing the two more critically acclaimed shows, 'mad men' and 'breaking bad'). the season 2 premiere on october 16 of this year broke the basic cable ratings record for a drama in the key 18-49 demographic. 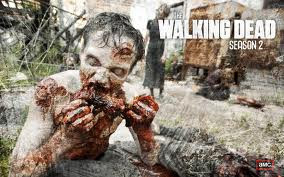 already renewed for a third season, it's safe to say that 'the walking dead' will be around for the foreseeable future. only 6 episodes long, season 1 really just served as a prologue to the more interesting story developing in season 2. in season 1, we follow a group of strangers as they try and survive a zombie apocalypse. though entertaining, it was pretty formulaic and nothing we haven't seen a million times before. in season 2, however, we are starting to see the group of strangers change from the scared victims that unified them in season 1 to more assertive individuals similar to the kids in lord of the flies. and if you read lord of the flies, unification was not their strong suit. like in many survival/apocalyptic stories, there is always the choice between sticking with the group for mutual benefit versus risking it out on your own (if you don't happen to agree with the group's choices). the key figure in this dramatic shift is shane who is best friends with rick (the group's de facto leader). shane has always been somewhat of a prick, if only because when people want to be comforted he is willing to tell them the hard truth (or his version of the hard truth). he is an "ends justify the means" type of character, willing to lie, steal and kill in order to protect the group and himself. unfortunately (or fortunately for us as viewers of a drama series), this does not always sit well with the group at large. whether they are just yearning for a civilized sense of being or if they truly believe that some law and order is required if they are to survive the long haul, we can't say. but there is a definite sense that individuals acting out on their own threaten the stability of their group even if their actions are completely understandable or defendable. this dynamic, which didn't exist in season 1 is where the show always needed to go and has done so very well this season. i didn't have great expectations for 'the walking dead' after season 1 but they have certainly hit their stride. hopefully darabont's departure won't affect the quality of the show but as long as they keep the stories compelling and the zombies dying, no reason not to keep watching.